By Dan Ambrose: After big talk by Golden Boy Promotions CEO Oscar De La Hoya of wanting to match Saul Canelo Alvarez against Gennady Golovkin in a trilogy fight on May 4, they instead have decided to match their popular star against IBF middleweight champion Daniel Jacobs (35-2, 29 KOs) on May 4 on DAZN at a still to be determined venue. What we don’t know is what kind of offer, if any, that Golden Boy Promotions made to Golovkin for the trilogy fight with GGG. In a recent interview, De La Hoya made it clear that he had a “set price” in his mind for what he feels that Golovkin, 36, was worth for a rematch with Alvarez. If GGG didn’t want to accept the offer for the third Canelo fight, then Golden Boy would move on and find someone else for him to fight. The way that De La Hoya spoke, he wasn’t in the mood to negotiate with GGG in the true sense. De La Hoya seemed to have his mind made up already about what he felt GGG was worth for a third fight with Canelo. That suggests that De La Hoya no longer felt that it was necessary for him to make a third fight with Golovkin. That might be a product of the huge $365 million contract that Canelo was given by DAZN, and the fact that the Mexican star’s fights are no longer PPV now that he’s with that platform. With the big contract from DAZN, there’s less of a need for Canelo to fight Golovkin for him to rake in the money. He’s already got the big money by virtue of his large contract with DAZN. Whether DAZN is going to exert some pressure on Golden Boy to make the third fight between Canelo and Golovkin is the important question. Certainly from DAZN’s perspective, they want to get value for their money, which means fewer mismatches like the one we saw last December with Canelo fighting Rocky Fielding, and more interesting fights between Alvarez and Golovkin. “If Golovkin wants to fight, I already have in my mind a set price of what he’s going to be worth,” De La Hoya said to Fighthub. “If he [Golovkin] doesn’t want to fight him for a price we say, then go fight somebody else. I can’t say [what the set offer is for GGG], but look, Canelo is happy where he’s at,” De La Hoya said. De La Hoya saying that if GGG “doesn’t want to fight him [Canelo] for the price we say,” means he wasn’t going to negotiate the fight with him. After everything Golovkin went through in his two fights with Canelo, he probably wasn’t in the mood to be dictated to in terms of the money. Golovkin had to wait three years to get the first fight with Canelo, and then deal with controversy surrounding the draw that the judges gave the Mexican star. Golovkin is going o have to move on with his career, and look to fight other fighters unless he wants to retire. Unless GGG signs with DAZN, he’s probably not going to ever get another chance to fight Canelo. As for who Golovkin should fight next, he can fight Jermall Charlo. The World Boxing Council wants Golovkin to take that fight, and they plan on ordering it at some point. Golovkin can also fight WBO champion Demetrius Andrade, but likely only if he signs with DAZN. WBA champion Rob Brant is an option as well. Golovkin can also move up to 168 to fight one of the champions in that weight class. If Golovkin wants to lose weight, he could drop down to 154 and challenge WBC junior middleweight champion Tony Harrison, IBF/WBA champion Jarrett Hurd or WBO belt holder Jaime Munguia. There are options for Golovkin, but none of them will be for the big money he got in his two fights against Canelo. Whether this was the bait and switch that De La Hoya pulled in order to get the boxing public excited about a third fight between Canelo and GGG is unclear. The timing of De La Hoya talking about negotiations having started between Canelo and Golovkin could mean that they were using GGG’s name as a tool to get Daniel Jacobs and his promoter Eddie Hearn of Matchroom Boxing to agree to a lesser price. If Hearn and Jacobs thought that they had to compete with Golovkin for the fight with Canelo, then it’s possible that they didn’t push as hard for a better split. Given the way that De La Hoya talked of having a “set number” for what he felt that Golovkin was worth, it seems pretty obvious that there was no real interest on his part in making a trilogy. We’ll see in the future whether De La Hoya is done with letting Canelo fight Golovkin or if this is just a temporary thing. It’s possible that De La Hoya is looking to avoid Canelo taking anymore punishment in fighting Golovkin in order to try and prolong his career. Canelo took a lot of heavy shots in his second fight with Golovkin last September. Compared to the first fight with Golovkin, Canelo got hit a lot with massive shots, and was hurt twice in the later rounds. 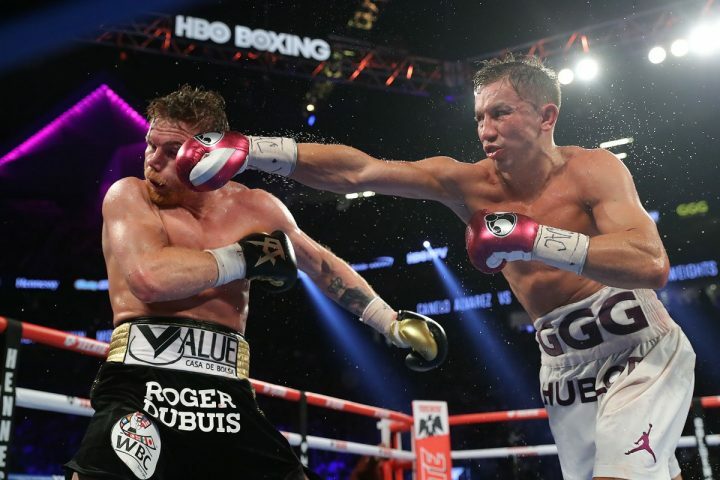 In the first fight with GGG, Canelo mostly just ran from him, and ate jabs for 12 rounds. That wasn’t a lot of punishment Canelo absorbed in the fight, but he also appeared to lose the fight. The judges in Las Vegas gave Canelo a HUGE break in scoring the fight a 12 round draw. Canelo didn’t come close to earning a draw in the eyes of the boxing fans. The draw hurt Canelo’s image, and his subsequent positive test for the banned performance enhancing substance clenbuterol didn’t help either. That was bad news for Canelo’s image. Blaming the positive test for clenbuterol on having eaten tainted meat didn’t go over well with the boxing fans. Many of them not only saw Canelo as a cheater, but also a liar as well. The 12 round draw that Canelo received against GGG in the first fight looked to some people like he was given special treatment by the judges in Las Vegas. Obviously, those talks between Golden Boy and GGG went nowhere from the looks of things, if there ever was any talks. Only De L Hoya is saying there were preliminary talks between Golden Boy and Golovkin. We didn’t hear anything from GGG or his promoter Tom Loeffler about talks taking place for a third fight with Canelo.